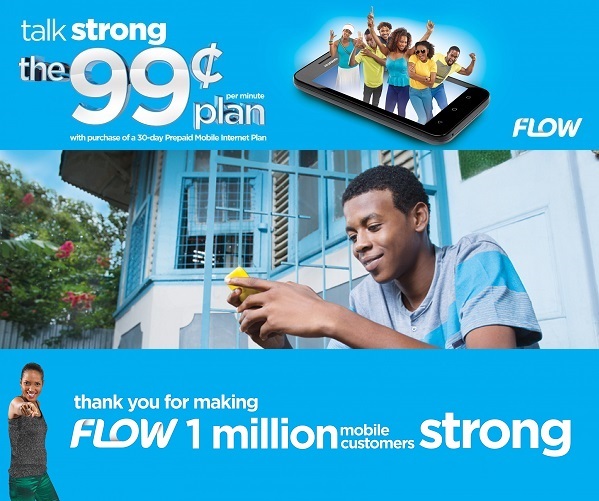 As you may well be aware, FLOW Jamaica has passed the 1 million customer mark since Friday May 20th 2016 as explained in How Flow Jamaica celebrated 1 million customers with a 99 cents FAM Plan. Most of the celebration seems to have been showered on the Prepaid customers as in the case of the 99 cents Plans as per my ditty FLOW Jamaica’s 30-Day Prepaid Mobile Internet gives you 99 cents Plan. Also they seem to have a choice between Talk EZ and XL Value Plans as detailed in FLOW Jamaica’s Prepaid Talk EZ and XL Value Plans. Even their XL Value Plan seems nice with Free Calling and Free Text along with a myriad of benefits as detailed in FLOW Jamaica’s XL Value Plan has Free Talk, Text, Nights, FAM and Faves. But the FLOW Postpaid customers have not been forgotten, as growing their Postpaid customer base is a part of their long term planning. After all, the majority of FLOW Jamaica’s Postpaid customers were originally Prepaid customers who were loyal to the company for many years before switching to Postpaid. So how do you become a Postpaid customer? Once you have these, the Customer Care Representatives at the FLOW Store will quickly process your application and issue you with a new SIM Card. you’ll also be given a complementary free Huawei Ascend Y300 or Huawei Ascend Y360 smartphone, albeit you can also purchase your own smartphone. In this article I’ll be focusing on the MyPlan Basic, with the other Postpaid plans being dealt with in future articles. First the MyMinutes Bolt-on; pretty straightforward, as it merely adds additional Minutes to your MyPlan Basic Plan. Then, for those of you data loving types toting a smartphone, there is the MyData Bolt-on that give additional Data to your MyPlan Basic Plan. Good to note here if you exceed your plan, you’ll be billed at a rate of JA$9.99 per megabyte. Finally, for the super Texters, the MyText Bolt-on has you covered, giving testing bundles to your MyPlan Basic Plan. So what about Tablet, Dongle, MiFi, Blackberry users and those of us wanting to stay in touch with relatives abroad? Are there any Blot-ons for such Postpaid users? If you have a Tablet, dongle or the very hard-to-get MiFi Device, the MyPlan Basic Plan is the best plan to have. This as you can add an Internet Plan which has some rather whimsical names. Finally, there is something for the Blackberry users, who FLOW Jamaica has not forgotten as evident from the Prepaid Blackberry plans listed in FLOW Jamaica’s Blackberry Plans support Trailblazers of Mobile Internet. Blackberry Data Plans exist for Postpaid users as listed below and are very similar to the Prepaid Blackberry plans. Good to note that these Blackberry plans are for all blackberrys. But for the Postpaid user who likes to stay in touch with family and friend who live abroad, the International Calling Plans are included just for you. These International Calling Plans you to call China, India, USA, Canada and landlines in the UK and Spain at low rates. Sharing is caring so share this article with your friends, encouraging them to switch to Postpaid on FLOW, the 1 million Strong Network!